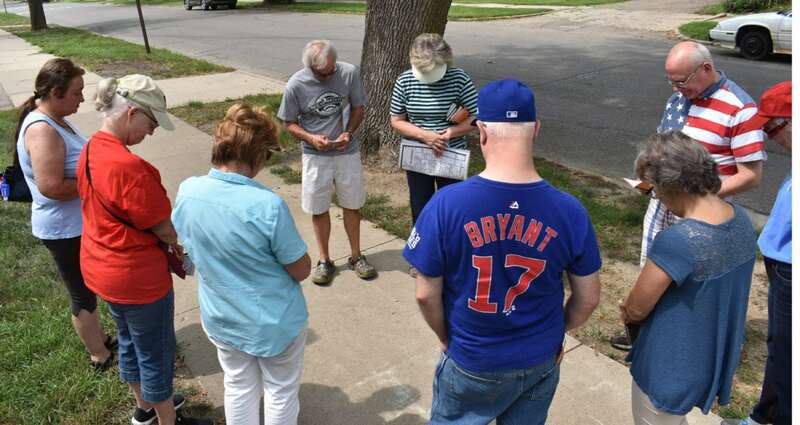 T-R PHOTO BY MIKE DONAHEY A group of Marshalltown residents pray for July 19 tornado victims and recovery efforts in front of Rogers Elementary School as part of Sunday’s Prayer Walk event. Prayers were led by Carl and Mary Jane Kolars, top center. 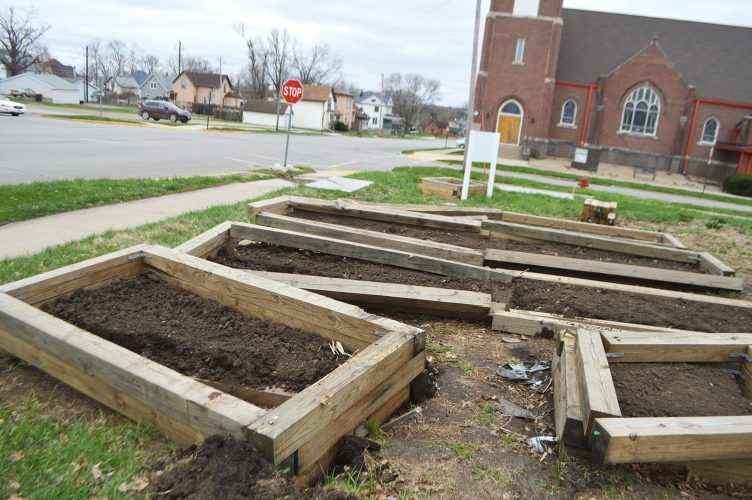 It was sponsored by Marshalltown Community Prayer Group Ministry. An EF-3 tornado hammered Marshalltown on July 19, causing millions of dollars in damage, but some residents don’t underestimate the power of prayer. That was one of several messages conveyed at four Marshalltown locations 2 p.m. Sunday afternoon as residents met to pray and walk for tornado victims and recovery. Sunday was selected to mark the tornado’s one-month anniversary. At Rogers Elementary School, 11 residents representing several neighborhoods, ethnic groups and faiths, stood in prayer and then departed in smaller groups, all walking on blocks where homes and vehicles were devastated. All participants were given the option of driving by damaged areas. 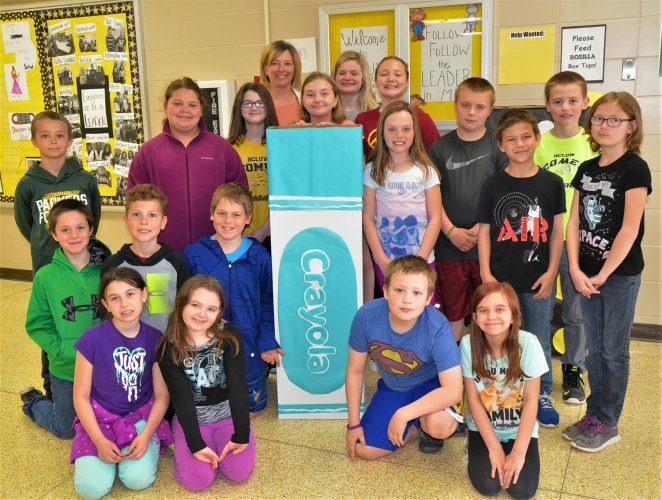 Other teams with a similar mission met at the Marshalltown Public Library, Franklin Elementary School and Woodbury Elementary School, said event coordinator Vonna Hays of Marshalltown. 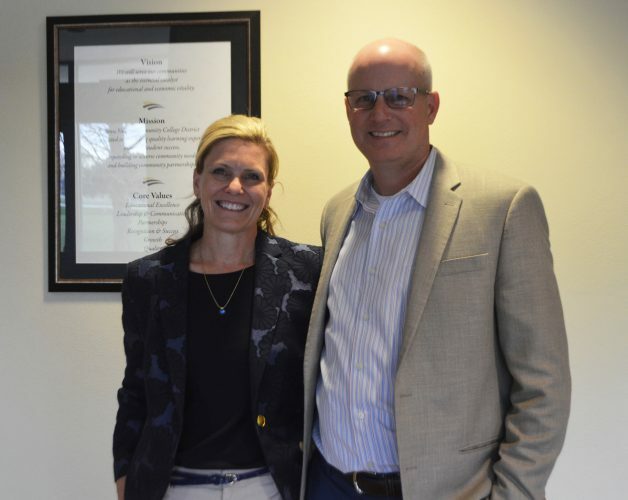 Julie Paustian, the first to arrive of the Rogers team, told team members God was with residents immediately following the tornado’s lift-off. Carl Kolars (Mary Jane’s husband) gave each team member a prayer booklet and small map of the neighborhood highlighting specific areas they could walk or drive. Marshalltown’s northwest quadrant, home to Rogers and Franklin, suffered extensive damage before the tornado continued down Main Street and into the northeast quadrant, home to Woodbury. Before departing their separate ways, Carl led the group in prayer. Area pastors and Marshall County Prayer Task Force sponsored Sunday’s event, and announcements were made at local churches and on Facebook. Hays said the prayer walks demonstrated residents of all faiths could come together in peace – opposite the tornado’s rage. She said details are being worked on for a public, city-wide worship and prayer event for the community Sept. 22. More details will be publicized soon, with information on tree distribution. “Join with us as we proclaim blessings over Marshalltown and take back the path of the tornado for God’s glory,” Hays said. For more information, or to volunteer, contact Hays, 641-751-5163.